Some people are born smart – the ones who invented computers and discovered planets. Most of us however are born average. We just need to struggle a little in studies just to get modest grades at school. Others are born with alternate learning styles that needs special education. But there are people born to have very slow or little learning capacity. These are usually the people we laugh at or ridicule because of their mental capacity. 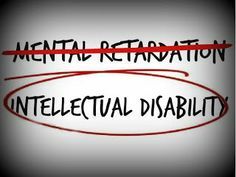 This condition they have is called intellectual disability. This means an intellectually disabled person has difficulties in learning and comprehending complex ideas and decision making as well as taking care of oneself. 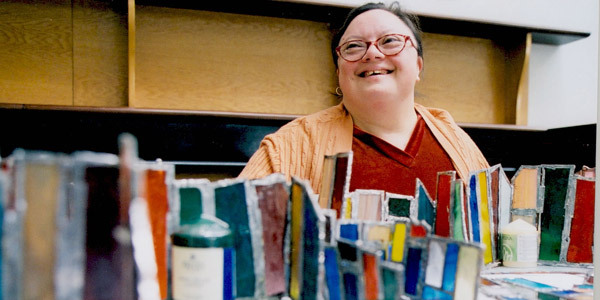 Intellectual disability is the opposite of giftedness. The intellectually disabled person has lower IQ and has poor adaptive skills. Generally there is no known cause for intellectual disability although genetic disorders may contribute. 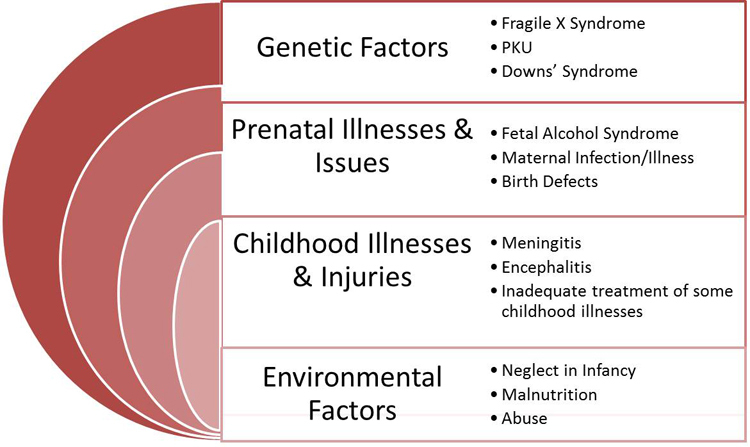 Down syndrome, velocariofacial syndrome, and fetal alcohol spectrum disorders are the three most common inborn causes. Klinefelter’s syndrome, Fragile X syndrome (common among boys), neurofibromatosis, congenital hypothyroidism, Williams syndrome, phenylketonuria (PKU), and Prader-Willi syndrome. Other genetic conditions include Phelan-McDermid syndrome (22q13del), Mowat-Wilson syndrome, genetic ciliopathy, and Siderius type X-linked intellectual disability are some of the common genetic disorders that may attribute to intellectual disability. Also mutations in chromosomes (human blueprint) can also cause intellectual disability. Problems during pregnancy or during birth when either the fetus did not develop properly or did have trauma during birth. For example, there may be a problem with the way the fetus’ cells divide as it grows. A pregnant person who drinks alcohol (see fetal alcohol spectrum disorder) or gets an infection like rubella during pregnancy may also have a baby with intellectual disability. If a baby has problems during labor and birth, such as not getting enough oxygen, he or she may have developmental disability due to brain damage. Exposure to certain types of disease that are not treated right away (whooping cough, measles or meningitis) or toxins (mercury, lead) can cause intellectual disability as well. Other causes include iodine deficiency, malnutrition and absence of nerves called arcuate fasciculus where it connects temporal and parietal lobes to the frontal lobe. The mildest of ID. This may not be obvious in early childhood, and may not be identified until children begin school. This may also be hard to differentiate with most learning disabilities and it takes a very skillful assessmemt to diagnose mild ID from learning disabilities (people with learning disabilities can have high IQs). People with mild intellectual disability are capable of learning reading and mathematics skills to approximately the level of a typical child aged nine to twelve. They can learn basic life skills and may gain some employment in adulthood. This is early always apparent within the first years of life. Speech delays are particularly common signs of moderate ID nevertheless speech delay isn’t only the hallmark sign of moderate ID as speech delays can also be common among children with higher IQs. They need considerable supports in school, at home, and in the community in order to participate fully. While their academic potential is limited, they can learn simple health and safety skills and to participate in simple activities. Usually people with moderate IDs live in support group homes or sheltered workshops when they become adults. 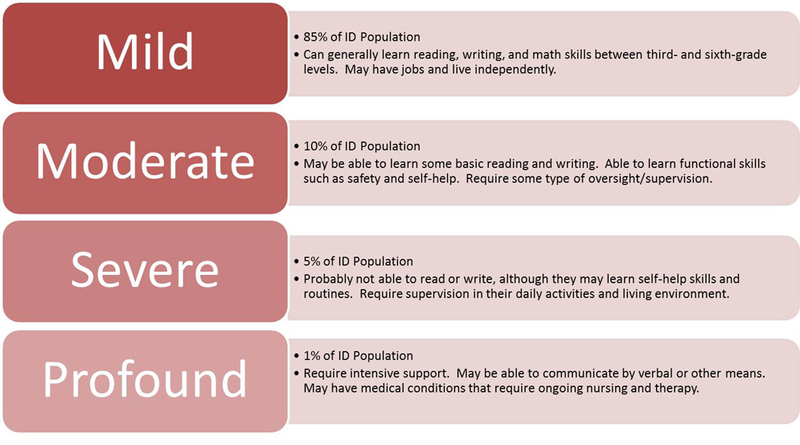 The most severe type of ID where they need more intensive support and supervision their entire lives. They may learn some basic life skills (bathing, brushing) but they need supervision by caregivers. They usually live in nursing homes when they become adults. Tests and assessment by a developmental paediatrician is a way to diagnose intellectual disability. Assessmemt by a school guidance counsellor can also do this. Also, ID is a condition present already as early as infancy. This condition is one of serveral developmental disabilities—that is, there is evidence of the disability during the developmental period, which in the US is operationalized as before the age of 18. That is a must in diagnosing ID to differentiate it from dementia – a neurodegenerative disorder characterised by deterioration of cognitive function and its onset must be in adulthood (18 or 16 above). Currently, there is no “cure” for an established disability, though with appropriate support and teaching, most individuals can learn to do many things. A combination of proper assessment, special education and family and community support is a strategy for intellectual disability. Although there is no specific medication for intellectual disability, many people with developmental disabilities have further medical complications and may be prescribed several medications. Usually children and adults with intellectual disability have other comorbid conditions like depression, anxiety and phobias and intellectual disabilities can co-exist with other developmental disabilities like autism and genetic disorders such as Down syndrome. These comorbidities are given medication for such combined with coping strategies for intellectual disability. Though there is generally no cure for ID, the ultimate goal for therapy is independence for mild ID and support and survival for the moderate to severe ID. Through this their dignities as humans are maintained. Intellectual disability affects about 2–3% of the general population. 75–90% of the affected people have mild intellectual disability. A quarter of people with ID have a comorbid genetic or other neurodiverse disorder. Both males and females can have ID. Intellectual disability is one of the most profound of all developmental or neurodiverse disabilities a human brain can have. This possess challenges to the individual as well as the family and community. Nevertheless people with ID are still humans who long to be loved and accepted. Instead of bullying and ridicule love and support is needed for people with ID in order for them to live to the fullest. Who knows, many of them have big talents and big hearts – even bigger than most of us. 5. Badano, Jose L.; Norimasa Mitsuma; Phil L. Beales; Nicholas Katsanis (September 2006). “The Ciliopathies : An Emerging Class of Human Genetic Disorders”. Annual Review of Genomics and Human Genetics 7: 125–148. doi:10.1146/annurev.genom.7.080505.115610. PMID 16722803. Retrieved 2008-06-15. 6. Sundaram SK, Sivaswamy L, Makki MI, Behen ME, Chugani H (2008). “Absence of arcuate fasciculus in children with global developmental delay of unknown etiology: a diffusion tensor imaging study”. J Pediatr 152 (2): 250–5. doi:10.1016/j.jpeds.2007.06.037. PMID 18206698. This autistic boy was once in a special education (SpEd) class, but when his mother decided to remove him from SpEd, he began to discover his real gift: physics. And he is quite happy with his studies. He also has a higher IQ than Albert Einstein (170 vs 150) and this child studies Nobel prize-worthy physics problems. Wow! Hope this sheds more light in having autism spectrum as a gift rather than as a disability. ASD (autism spectrum disorder) folks are usually found in computer and physical sciences, and music departments as well as engineering and math department. Cool huh? Better than hopeless romantic, promiscuous business tycoons. In fact, I would love to date an autistic Physics professor rather than a buff Medicine student. Keep out, bully neurotypicals if you discriminate ASD people!